“Was it the day You stood as the Primeval One? Or was it the day you emerged as the Trinity? Could it be the day the Earth and Heaven appeared? And shared your form with The Woman of Divine beauty? You enshrined yourself at Tiruvaroor? In this verse, the Saint wonders when the Deity chose to ensconce Himself at Thiruvarur. He asks if Thyagarajaswami graced Thiruvarur with His Divine energy before or after Shiva's cosmic dance at Ambalam (modern Chidambaram)? Was it before or after Shiva decided to manifest Himself? Or was it before or after Shiva gave the world the four Vedas? Thiruvarur, a town in modern Tamizh Nadu’s Tanjavur district boasts this incredible ancient temple with unsurpassed continuity of living tradition and spiritual energy. The temple has served as an icon of the Tamil land, its environs fostering the best in human creativity and the attainment of spiritual potential. Of all the beautiful temples of Tamil Nadu, this Thyagarajaswami temple at Thiru Aarur (Thiruvarur) has the most complex sacrosanct connections between the devotee and divinity. It is a vital center of the Tantric Sri Chakra spiritual energy and the ancient practices established over millennia continue to be in active practice to this day. The antiquity of the temple predates the documented history that begins from the time of Mahendra Pallava. The province of Thiruvarur, prominent because of the energy of the Thyagarajaswami temple, also included temples in Thiru Moolatannam and Araneriyam during this Pallava period. Later, in the 9th century, following Saint Sundaramurthy Nayanar's poems, the temple at Paravayunmandaliyum was also included under Thiruvarur. Subsequent inscriptions note rule and contribution of Pallava, Chola, Pandya, Vijayanagar, Thanjavur Nayaka, and Maratha empires. The unbroken traditions of this temple survived the changes of the kingdoms and absorbed their influences in art, craft, literature, and history. The Thyagarajaswami temple once called Poongkoil has a synonymous association with Thiruvarur today. Standing before the Lord, graced by his welcoming smile, one can feel the rapture that inspired so much poetry. Thyagesha, Thyagarajaswami sits in his Durbar, a king with his queen, and between them, their son Skanda dances. This Somaskanda icon (sah for Shiva, Uma and Skanda) is one of the rare icons that is considered “munnilum mummutankku pinnalakar”, thrice as beautiful at the back than the front. Yet, one cannot imagine what could be more beautiful than the captivating smile of Thyagaraja as one surrenders completely, involuntarily and voluntarily to the embracing and comforting energy He emanates from the Sanctum Sanctorum. Drawn to this magnificent image in all its surrounding grandeur and enraptured by His smile, all else melts into insignificance. We do not notice that the icon remains hidden behind heaps of fragrant jasmine blossoms and bilva leaves, and with good reason. With this icon resides the Sri Chakra, the most potent emblem of energy and concentrated power that attracts our potential to its core. The Sri Chakra is etched on a plate on the idol and always hidden from view lest the power fall into inexperienced hands. The Somaskanda Thyagesha is a regal Shiva, a royal father, and husband, a supreme example of royal manhood. As Thyaga- Raja, Shiva is seen as the progenitor of the human race rather than the form of a starving, begging, yogic ascetic or the fiery cosmic dancer he often assumes. He is also the Lord, King of Thyaga, renunciation and giving. The Saint Kumarakuruparar in his “Tiruvarur Naanmanimalai” states that this Lord gave the Universe to Vishnu, nine treasures to Kubera the God of Wealth, bestows happiness and domestic bliss to His devotees and shared half of Himself with Neelotpalambal, His constant companion and consort. The sacrosanct antiquity of this sthala predates the icon of the divine family. The presence of Skanda, Murugan, is considered an inordinately significant link between Shiva’s presence as the main Deity to local worship revolving around Murugan. Murugan or Skanda, Shiva’s enlightened son, a warrior, and lover of the mountain bride Valli, has held popular identity as the god of hunters and hill folk of the Tamizh peoples. The God of the forest, he is associated with rain and fertility of the land. The snake and the anthill, symbols common to Shiva and his much loved child, are independent shrines in the Thiruvarur temple complex. They bear no date and seem to have existed as far as cultural memory can reach. Tiruvarur has an ancient Nagabila, a serpent-infested maze of subterranean connections to the netherworld, with its focal Deity, Hatakeshwara. Valmikinathar, Lord of the Anthill, is still the moolavar, the main deity revered at Thiruvarur. Valmikinathar’s consort Bhoga Amman, cast for eternity in bronze sits in the tribhanga pose with her hand on Prithvi, Earth. Her contact with the earth anchors Tiruvarur as the Bhoomi Kshetram of the pancha bhootha kshetrams. Valmikinathar as an anthill is bedecked with flowers and holy ash. The presence of the Saptamatrika panel in Tiruvarur, the oldest sculpture in the complex of Pallava origin, affirms the powerful Ugra devata fierce goddess cult associated with temples like Tiruvarur, revived and adapted with the Shiva faith. The temple complex represents the Sri Chakra with the seven enclosures representing the seven layers of the Sri Chakra. Circumambulating the various shrines, you leave the inner prahara marked by a high stonewall etched with inscriptions and come to the Kamalamba sannadhi. The Thiruvarur Devi, Kamalambal, is the yogini. She is the tantric focus of spiritual power. Her shrine faces North, the direction of Kailasam, symbolizing release from the cycle of birth and death. She sits cross-legged in virginal purity contrasting the more earthy and sensual Bhoga amman within the inner precincts. Mudduswami Dikshadar, a tantric initiate, and a genius Sanskrit composer of inordinate logical methodology and incomparable creativity recalls Sri Vidya tantirsm and powers of Kamalamba as the yogini Diety in his exquisitely rendered Kamalamba Navaratna Kritis. On the average day, nestled in a silver casket placed to the right of the bronze Somaskanda is an emerald Swayambhu or self-formed linga called a Vitanka. This natural manifestation of the Linga, which is not only the phallic symbol of creation but also the symbol of the rise of the Kundalini force, is particularly sanctified and revered with daily ablution and ritual in a beautiful ceremony. Its presence in Thiruvarur makes the place one of the Sapta Vitanka kshetras, one of the seven sacred places where a self- formed, un-chiseled Linga associated with a particular Chakra of Kundalini energy is venerated. Thiruvarur is identified as the Muladhara Kshetra, the base energy center where the Kundalini energy lies coiled like a serpent. When the energy uncoils and rises through the naturally formed lingam, it appears like the magnificent precious Vitanka. This emerald lingam, symbolizing the union of Shiva and Shakti is a Sri-Vidya Tantric symbol. In one text, Vitanka is interpreted as the abode of the birds. This evokes the hamsa, literally swan, the image of Kundalini energy that comes with ultimate salvation. As ritual and religious iconography evolved with the socio-political aspirations of the time, Thyagarajaswami established Thiruvarur as his royal court. Going by the Sthala puranam, the story of the sacred site, as refined in the 16th century, Vishnu, desperate for a son, meditated on a Shiva Linga. Shiva appeared with Uma and blessed him. Uma, on the other hand, enraged that Vishnu had ignored her, cursed the child with instant death. Vishnu had Visvakarma, the craftsman of the gods, sculpt an image of the divine nuclear family on the same plane and repented by including Uma in his prayers, acknowledging that without her, there was no Shiva and without him, she was incomplete. While all this unfolded, Kaliyan, an asura, invaded the heavens. Indra approached Vishnu for the Somaskanda, with whose protection he successfully defended the heavens. Soon after Valan, another asura, attacked the heavens. This time Indra turned to Muchukuntan, a Chola King. Muchukuntan assisted him asking for the Somaskanda when the enemy was vanquished. Vishnu acceded the request and Muchukuntan is said to have installed Thyagesha at Thiruvarur. The rise and fall of Vishnu’s chest as he meditated upon the Somaskanda enshrined on his breast is evoked in the ajapanatanam, the special dance of the Thiruvarur Somaskanda during the annual Utsavam. On Earth, around the 5-7th century, as the Pallava monarchs sponsored research and refined the art of temple architecture as we know it today, they evolved the first traces of Somaskanda in bas relief stone and then in the experimental medium, bronze, for the Utsavam possessions. 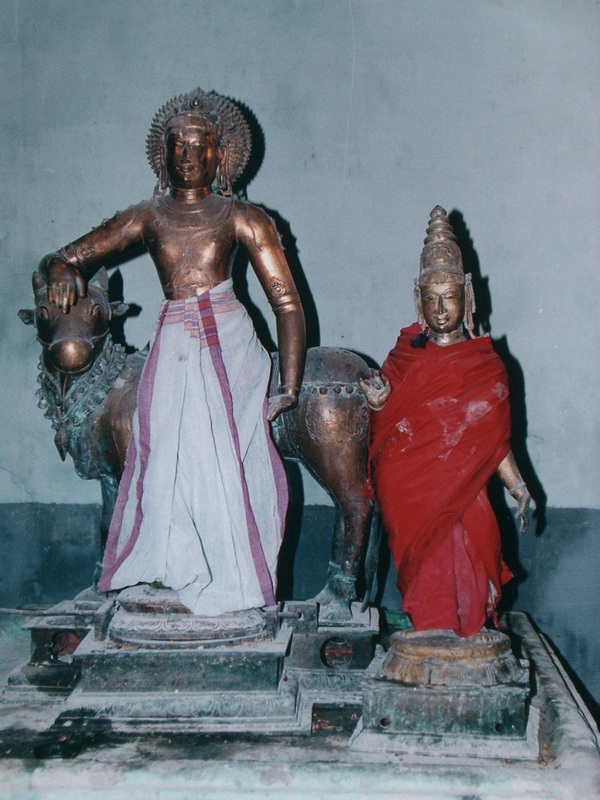 The Somaskanda is one of the Lilamurthis, a form adopted by Siva for divine sport on Earth. Shiva supposedly performed 364 such Lila’s in and around Thiruvarur. The transition of the tradition between one dynasty and another is apparently seamless as the Chola Kings adopted, refined and popularized the Somaskanda iconography in bronze. As far back as 6th Century A.D., this Aarur Moolastanam, the Sacred Primary Site at Aarur, and others such as the Araneri temples were popular, flourishing as bastions of art, culture, and tradition. The Thiruvarur temple complex was obviously extremely well known in the 6th century AD and had well developed, characteristic and esoteric traditions even at that time. A poem of Thirunaavukarasar reveals that the temple traditions of Marghazhi Aathirai Vizha, Panguni Uttirai Perunaal, Veedhivitakanin Veedhi Panni, celebrated for Thyagaraja and Neelotpalambal today, existed even before the 6th century A.D. These temples were originally bricks and mortar structures with a lot of woodwork. Mahendra Pallava patronized this temple and added many features, notably, the shrine of the Sapta Mathrikas (the seven mothers), Ganesha, Maheshwara, and Durga in the outer prahara (second perimeter around the temple) and the Yama Chandikershwarar in the inner perimeter (first prahara). Later, from the 9th and 10th centuries A.D. the Imperial Cholas undertook a project of immense magnitude wherein they set about revamping all the major South Indian spiritual centers, temples, using the more durable medium, granite. The Thiruvarur Thyagarajaswami temple was first rebuilt as a granite structure by the Chola king, Aditya I. Aditya Chola I was the son of Vijayalaya Chola who resurrected the Chola line in the 7th-8th Centuries AD. He is credited to have created 64 Shiva shrines along the Cauvery from Madikeri to the Bay of Bengal. Aditya I had developed a unique, signature architectural style well recognized today as that developed under his patronage. At Thiruvarur, the Thyagarajaswami temple has several elements that are evident in this style: The temple’s Peetam, Upa Peetam, Goshtam, and the shape and style of the Vimana. The two dwara palakas (door guards) outside the shrine of the main Linga, Vanmeekanadar or valmikinathar in the inner sanctum appear to be from his time. In the same chamber, Shiva and Parvathi are portrayed as a newly married couple. They stand holding hands and surrounded by the Devas. While we do not know when this sculpture was done, the style of appears to be from these early Chola times. Apart from this and a Dakshnamurthy, an image of Shiva as the Vedic guru, there are also other interesting images such as one of Krishna with his flute from the same time. The sculptures of Durga and her warriors, Kangalamurthy, Arthanareeshwara, Lingothbhava, various kings match the beauty and antiquity of sculptures found in Thirunageshwaram (also known as Keezhkottam) and Srinivasanallur near Kumbakonam. The well respected and famous Chola Queen-Grandmother Sembian Mahadevi (wife of Gandaraditya Chola) inspired Rajaraja Chola I to revamp all temples built with brick, mortar, and wood into permanent granite structures. 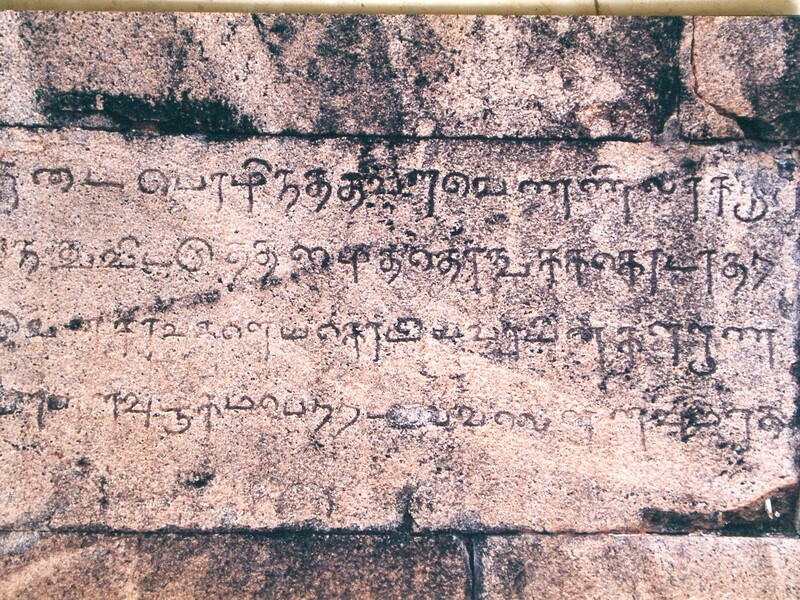 A Rajaraja Chola I inscription states that Queen Sembian Mahadevi personally supervised the conversion of the Karuvurai and Ardhamandabam of the Araneri temple. Such personal interest, involvement and patronage of the Royals in matters of religious and spiritual importance is well documented. While archeologists say that the Karuvurai is in the Queen Grandmother's style, there is some confusion whether she rebuilt an older structure built by Aditya Chola. The Chola king Rajendra I, son of Rajaraja, alsoknown as Madurantaka II after his Grand Uncle, rebuilt the existing Thiruvarur Thyagaraja shrine in stone at the behest of his mistress Paravai. He is also credited with upgrading some of the surrounding mandapas. The independent shrine complexes for the two Goddesses of this temple, Neelothpalambal and Kamalambal, were upgraded by many kings and the art in those chambers reflect several periods. The Mughamandapam was constructed later. The first of the most arresting features of the Thiruvarur Thyagarajaswami temple to greet the devotee is the architecture of the great entryways, Gopurams, at the four cardinal directions. Each of the four exterior perimeter walls of the Thiruvarur temple has a large big Gopuram with reinforced wooden gates at its center. Of these four Gopurams, the Eastern Gopuram on the outermost perimeter wall called the RajaGopuram because it conforms to the Vaastu Shastra concept of a Maha Dwara (great entrance) is by far the most exquisite. Built between the 12th and 13th Century by the Cholas, the tall doorway of the RajaGopuram is characteristically a granite structure up to the lintel level. This humongous granite base has several rearing Yali figures, each mounted by a rider. The elegant slender bodies of these horse-like creatures that sport the face of a lion and the delicate relief carving on them are unique to the Chola artisans. These Yalis are mythical animals created to represent different stages of life. The six story, tapering superstructure above is constructed with deep red brick and mortar. Each of the six levels is proportionately smaller than the tier below, hollow, and set with proportionate window apertures aligned along the inner and outer facades. The RajaGopuram is a not only a work of art, a repository of visual cultural history, and religion, it is also a result of ancient South Indian politics and a bearer of political history for future generations. 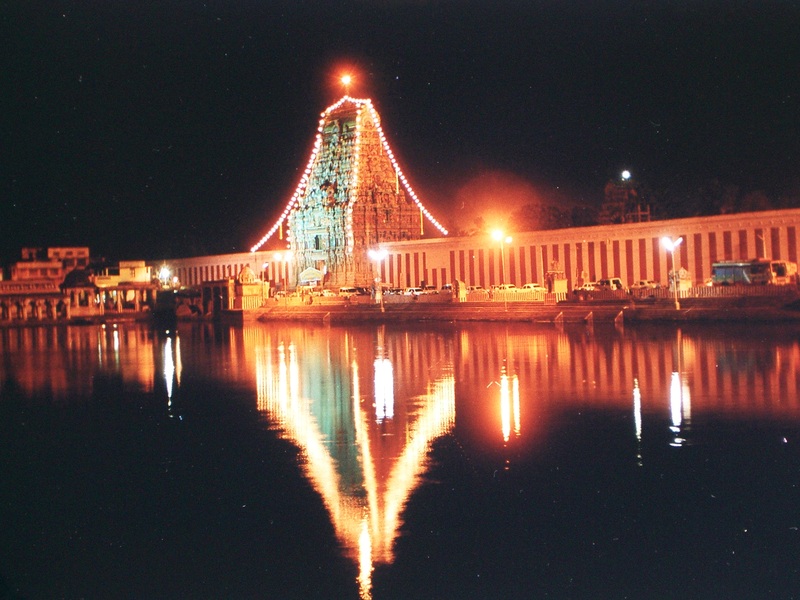 The construction of the RajaGopuram is associated with interesting history. In 1202 A.D., there was a great war between the Cholas and the Pandyas. The Chola king Kulothunga Chola III caused great havoc on his enemy Sadayavarman Kulashekara Pandya and in the end, the Pandyan king ran away from the battlefield. The victorious Chola king celebrated his victory by crowning himself again in the Pandyan capital of Madurai as the Thirubhuvana Veerathevan (the victorious warrior of the three worlds). He then used the vast treasures of the Pandyan kingdom to raise a new temple at Thirubhuvana Veerashwaram and used some of the funds to construct this RajaGopuram at Thiruvarur. In addition, the historical book Kullothunga Meykirthi and the Thribhuvam inscription song attest that Kulothunga III assigned villages in the Pandyan and Chera countries to support this temple at Thiruvarur and offered all spoils from the war to the Deity, Thyagarajaswami, affectionately known as Thyagesha. A lasting image of this warrior benefactor, Kulotunga Chola III witth his guru Easwara Shivar, has been sculpted in the second tier of the RajaGopuram. While structurally and aesthetically similar to the Eastern RajaGopuram, the Western Gopura has some beautiful figurines of dancing women and other old sculptures. Interestingly, there are no figurines that depict Demi-Gods, Devas. The Eastern side of this Gopura has several beautiful fresco murals that have not been the dated yet. While it is dated as built in the 15th century A.D, there is unfortunately no clear evidence with regard to the patron who had it built. A Thanjavur Nayaka King, Sevappan, built the Northern Gopura. This Gopura is constructed using granite blocks up to the base level but does not have any sculptures on it. On the second level off this Gopura, there are figurines of this King and the manager of the temple of that time. Sevappan has left some inscriptional record on this Gopura. Apart from this exterior perimeter wall, the inner sanctum of the temple has two other concentric squares of perimeter walls that separate it from the busy streets outside. Two Gopurams on the first inner wall and another, smaller one on the second inner wall beautify the temple. Successive kingdoms that added these grand entryways to the sanctum have done so keeping in mind the overall aesthetics of the temple and have ensured that their contributions have enhanced the breathtaking impact of the entire complex. Muthu Kaviarasar in his drama on the Deity and Manuneedhi Cholan, Thiyagesar Kuravanjiyam describes the tall Gopuram that reaches with a crescendo of energy into the eastern sky. As we enter the outer walls and proceed towards the Sanctum, the Eastern Gopura that opens into the second compound belonging to an earlier Chola period stands stark, without any distinguishing or significant artistic sculpture. The corresponding Western Gopura on the same wall appears to have been constructed with granite blocks. It was re-built during the time of Vijayanagara King Devaraya II (1422-1446 A.D.). Tamil and Kannada inscriptions on this Gopura say that a man called Nagarajar built it under the patronage of Dakshina Samudradipathi Lakkana Thanna Nayaka who was a feudal king of the Vijayanagar Empire. The innermost wall and final barrier to the sanctum has only one entrance and the Gopura on this entrance was from an earlier Chola period. Because this Chola period. Because this Gopura has been upgraded many times by different kings, the artistic additions belong to many emperors. Once in twelve years every temple has to be consecrated with a ritual ablution of the pinnacle of the vimanam or Kumbha. 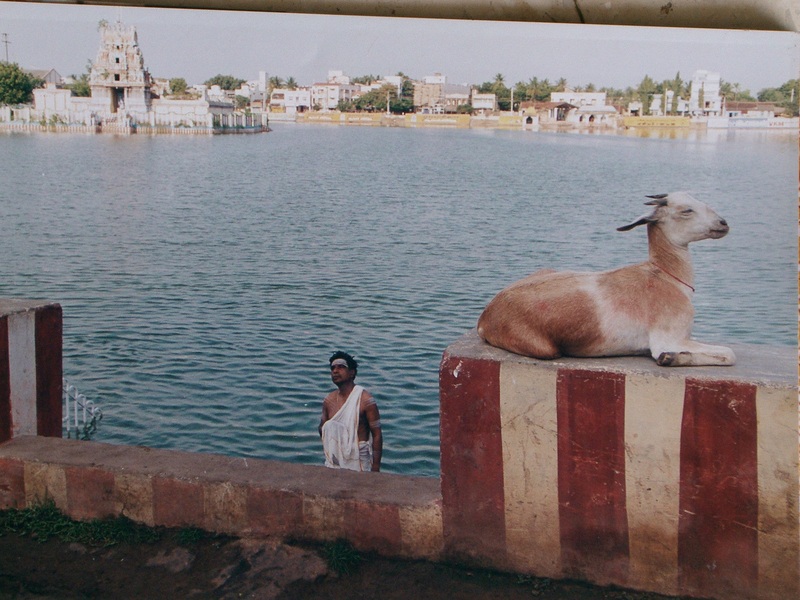 The Thiruvarur Kumbabhishekam was performed in April 2001. Spectators sat on rooftops and watched, the festive air resounding with the ancient poetic verses sung lovingly to the Lord by the temple Oduvars. The bronze Somaskanda was the presiding deity at these ceremonies. Typically pillared halls with granite slab roofs, mandapams were created as large congregation halls. Thiruvarur, being a very popular and powerful sthala, necessarily had many such ancillary structures. Sekkizhar in his Periyapuranam describes the beauty of the mandapams of this temple in the story of Siruthonda Nayanar. The mandapams of this temple have all the required components as required by the Agama Shastras: the base, Peetam, The raised plinth, Upa Peetum, The layer of lotus petals in bas relief Padmam, and the crest Kumudam. Beautifully sculpted pillars support the roof, made of large granite slabs. The fresco art on the ceiling of these mandapams temple range from the early to late Chola periods. Aditya Chola I's Karuvarai and Ardhamandapam, his successors developed the temple to have a Mughamanadapam and a Mughaamandapam. The largest mandapam, the Deva Siriyam is one of the famous ancient monuments of Tamil Nadu. By virtue of being the site where the great poet Sundaramurthy Nayanar created his Thiruthonduthogai, its association with this benchmark in the resigious-poetic history of Tamil Shaivism remains unforgotten. As a mandapam, the sheltered open space served as a stage for Koothu, a special form of native theatre of Tamil Nadu that involved music, dance, and drama in an opera style setting and the more classic and codified form of dance, Bharathanatyam. This artistically designed mandapam has hosted many historical events. Several inscriptions attributed to the Imperial Cholas attest that this was a popular venue to host town council meetings, and conference feudal lords and royalty to discuss national, social, business, and security issues. The Mandapa lent itself to grand occasions and was the preferred location to receive ambassadors from many nations. Of all the royalty that came and went, only the presiding Royal Deity, Thyagarajaswami and his Queen Neelothpalambal continue to hold royal court here during the Panguni Uttiram and Aathirai festivals. The art in the Rajanarayan Thirumandapam has seen the effort of several generations of artisans under several regimes. Many of this remains juxtaposed with the oldest sculptures blending in seamlessly with the new. Sculptures of lions embellish the pillars supporting the roof. On the ceiling are many beautiful sculptures of women in dance postures. The great king Rajendra Chola I conquered Kadram (Malaysia), Sri Vijaya (Sumatra), and Mappalam (Bali). A pious woman called Nangai Nallal Paravai however conquered his heart. Inscriptions say that this woman inspired this king to built a new mandapam and make several additions to the temple. He is credited with the current edifice that houses the Main Deity. Through a process of deduction, the mandapam called the "Sabhapathi Mandapam" may be this king's creation. The temple complex sprawls over twenty acres. Kamalalayam, the Lotus tank after the tantric diety, Kamalambal, outside the western gate is one of the largest in the country. Maintaining a tradition unbroken for over two thousand years, theppam, a joyous festival on a full moon January day is celebrated. A large raft with musicians singing praises of the lord is floated on the Kamalalayam. A ten-day Utsavam is celebrated every year during the months of March/ April. Thiruvarur is the only ancient shrine in India that instantly reveals so many different styles expressed over successive centuries of stone art and sculpture in India. The countless Chola, Pandya, Pallava, Hoysala, Maratha, and Nayaka sculptures and paintings make the study of the evolution of form, line, image and theme in traditional art a possible study through this one temple complex alone. Mahendra Pallava, the greatest patron, artist and critic of all the 64 forms of artistic expression recognized and patronized at the time was conferred the title “Vichitra Chittan” for his ability. He patronized the art created in and for this temple and oversaw the finest expressions of the artistic forms appreciated at the time. There are sculptures of the 64 karnas (postures) and the abhinayas (expressions) of Bharathanatyam (the dance of India) depicted in the finest detail on the Gopurams and the mandapams. Narasimha Pallava, the son of Mahendra Pallava, was a famous warrior king and like his father, a great and knowledgeable patron of the arts. His campaign against the Chalukya King Pulikesi II in revenge for the latter's invasion of the Pallava country during his father's reign is a well established historical event. Paranjothi, his Commander-in-Chief who led the campaign and ultimately destroyed the capital Vatapi in a single night's encounter, was a devout Shivite who desired nothing more than to retire in the service of Shiva. Inscriptions reveal that Parajothi deinstalled and brought back a popular and much venerated image of Vinayaka, Ganesh that was revered and held in great esteem by the people of Vatapi. There are two theories as to where he installed this Vinayaka, this trophy of war commemorating a landslide victory against the Chalukyas. One theory goes that he installed the "Vatapi Vinayaka" in Thiruchenkattukudi, his birth place. The other theory is that he installed it in Thiruvarur. Subsequent investigations have conclusively proved that Kulothunga Chola installed the idol at Thiruchenkattukudi and the one in Thiruvarur is the original “Vatapi Ganapathi”. Several centuries later, Muthuswami Dikshtar created his famous song "Vatapi Ganapathim Bhaje" in Hamsadwani Raaga before this diety. The presence of rare, ancient musical instruments, inscriptions copper plate inscriptions, artistic bronze and stone sculptures, the dated historical antiquity of the temple car, and the unbroken tradition and power of the temple as a sacred and historical site makes the Thyagarajaswami temple at Thiruvarur probably the largest repository of Tamil cultural values and traditions. Thiruvarur has inspired and fostered creative genius over the centuries. The Periya Puranam was authored here. Sundarar sang moving euologies of 62 ardent devotees of Shiva in his “Thiruthondatogai” and his work cannonized them as the foremost Saints of South Indian Shivite Bhakti. People remembered the greatness and devotion of Sundarar himself and included him as a role model saint and till today, every temple in South India remembers this “aravati moovar”: the 63 Saints, Naayanmars, who surrendered to Shiva with unstinting and complete love. The three contemporaries, Thyagaraja, Shyama Shastri and Mudduswami Dikshatar were all born in Thiruvarur. This famous trinity of Carnatic music composed enduring devotionally inspired classics here. The traditions of the Thyagaraja temple are unique and spiritually spectacular. The usual Pradosham that occurs twice a month in all Siva temples is performed everyday as the Nitya Pradosham. Every evening at Pradosha Kala, sunset, elaborate pooja is conducted with several aratis using camphor and butter lamps of various sizes. Handfuls of jasmine and fragrant red roses are used to bedeck Thyagarajaswami. The elder priest chants leisurely, “Om Namah Sivayah, Sivayah Namaha”. The devotees who throng there echo the call to Shiva. Some reach spiritual satisfaction with simplicity, from the emotionally moving presence of the royal protector and his family. Others delve deeper into the tantric power and practices to elevate their inner selves and aspire to reach the Lord. A spot on the spectrum, each devotee senses the energy in the soil; the modern spirit resonates with the ancestral soul as each individual searches within and without for peace, happiness and moksha, deliverance.